Adipocytes, or fat cells, are important endocrine and metabolic cells critical for systemic insulin sensitivity and both adipose excess and insufficiency are associated with adverse metabolic function. Mature adipocytes develop in a process called adipogenesis , whereby preadipocyte precursors differentiate into lipid laden fat cells. Adipogenesis is driven by a network of transcriptional regulators active at different stages of cell differentiation. Rabiee, Jensen and colleagues hypothesized that upon induction of adipogenesis, protein post-translational modifications (PTMs), in particular phosphorylation, play a major role in activating and propagating signals within the transcriptional regulators networks. 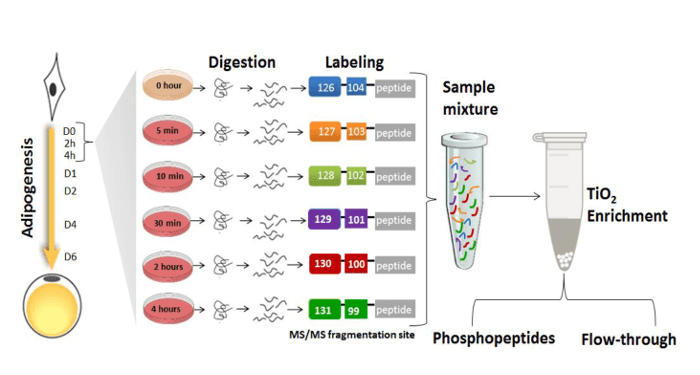 They applied mass spectrometry-based quantitative proteomics and phosphoproteomics to monitor nuclear proteins during the first 4 hours of preadipocyte differentiation which revealed significant changes in the phosphorylation of multiple transcriptional regulators. Adipogenic stimuli increased the nuclear abundance and/or phosphorylation levels of proteins involved in gene expression, cell organization and oxidation-reduction pathways, whereas negative modulators of gene expression, insulin stimulated glucose uptake, and cytoskeletal organization showed the opposite trend. The researchers created a useful kinase-substrate database based on the relationship between protein kinases and the identified protein phosphorylation sites and their results suggest that the cyclin-dependent kinase family and the mitogen activated protein kinase (MAPK) family act as orchestrators of early adipogenesis.